Candesartan analog as angiotensin II antagonist. 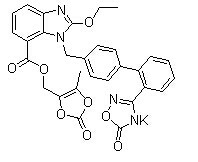 Azilsartan Kamedoxomil is an azilsartan prodrug and angiotensin II type 1 receptor blocker used for the treatment of hypertension. 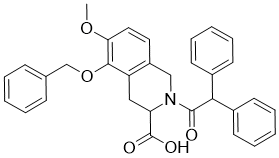 EXP-3174, also known as Losartan Carboxylic Acid, is a physiologically active metabolite of losartan, produced by cytochrome P450 isoforms in the liver. 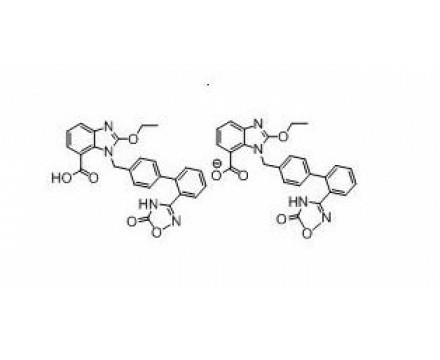 Olodanrigan, also known as EMA-401 and PD-126055, is an angiotensin AT2 antagonist potentially for treatment of postherpetic neuralgia (PHN). BIBS-39 is a novel, nonpeptide angiotensin II receptor antagonist, showing antihypertensive activity. 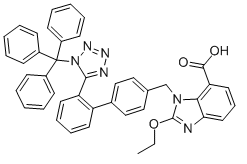 Azilsartan is a specific and potent angiotensin II type 1 receptor antagonist with IC50 of 2.6 nM.